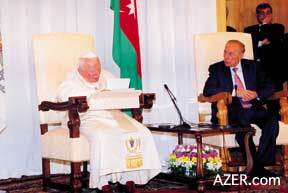 Left: Pope John Paul II met with Azerbaijani President Heydar Aliyev during his May visit to Baku. Right: More than 5,000 people attended a two-hour Solemn High Mass during the Pope's visit. On May 22-23, 2002, Pope John Paul II (1920-), the spiritual leader of more than 1 billion Roman Catholics worldwide, visited Baku. The Polish Holy Father has served in this office for 24 years, since 1978. Despite his advanced age of 82, and lack of physical mobility due to Parkinson's disease and severe arthritis, the Pope honored President Aliyev's personal invitation to visit Azerbaijan. Aliyev himself met him at the airport, as did most of the members of the diplomatic corps. The Pope was accompanied by quite a large delegation, including 170 journalists. Aliyev welcomed the Pope and praised his courageous decision to break centuries - long tradition by visiting a predominantly Muslim country. No doubt, in the wake of the September 11, 2001 terrorist attacks on the United States, which have been traced back to radical Islamics, Aliyev wanted to draw attention to his country's long-standing acceptance of other religions. Though traditionally Muslim, Azerbaijan does not name any official State religion in its Constitution. In addition, freedom of religion is guaranteed to all, as is the separation of Church and State. The Pope held a Solemn High Mass at the Palace of Hand Games, which is located on the Boulevard next to the Caspian Sea. During the Mass, the Pope addressed the crowd in Russian, calling on religious leaders to denounce all forms of violence and become tireless advocates for peace and human rights. "Enough of wars in the name of God!" he said. "No more sacrilege and blasphemy of His Holy Name! I ask religious leaders to reject all violence. As long as I have breath within me, I shall cry out: 'Peace, in the name of God!'" This was the Pope's sixth visit to a member state of the CIS (Commonwealth of Independent States) and his 96th trip abroad since his appointment. He had already visited the other Caucasus countries of Georgia and Armenia in 2001. In visiting former Soviet Union Republics, the Pope has tried to publicly acknowledge and honor the people who held fast to their faith despite the persecution they suffered during the Soviet era. Here Fulbright Fellow and former Catholic altar boy Jim Dasney gives a behind-the-scenes glimpse of the Pope's visit to Baku. 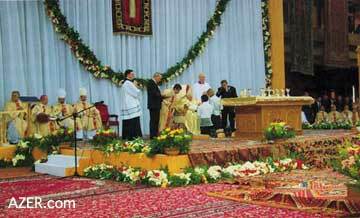 Right: Baku's Palace of Hand Games was richly decorated with carpets and flowers for the Solemn High Mass said by the Pope. It seems that my years of Catholic altar boy service have finally paid big dividends. Maybe it's because not so many years ago, my mom pulled me aside after Mass and told me to start wearing socks. (Some of the parishioners had complained to her about seeing my bare legs in my red sneakers.) Mom always joked that the red obviously meant that one day I would be a Cardinal. Well, that would be a long shot, but at least I can boast that I got to rub shoulders with the Pope on his recent visit to Baku on May 22-23, 2002. I had seen John Paul II once before in the late 1980s at the Los Angeles Coliseum, when he had played to a packed house. This visit to Baku was much more intimate; in fact, according to the Vatican, Azerbaijan's Catholic congregation is the smallest one that the Pope has ever visited. I had the privilege of participating in the Mass, which took place on the second day of the Pope's visit. As there is no cathedral in Baku, the Palace of Handball Games was converted into a sanctuary for Mass. The interior was beautifully decorated with flowers and dozens of Azerbaijani carpets in bright reds. Actually, I was also involved in some of the preparatory events in the days that led up to the Pope's arrival in Azerbaijan. The primary languages used at the dress rehearsal were Italian and French. Russian was third; Polish and Slovak were fourth and fifth. German, English and Azeri were also squeezed in there somewhere. The night before the Papal Mass, we met to receive final instructions. A kindly Monsignor coordinated these tasks. He seemed to speak every language except English with us. He was a master of ceremonies of sorts. He showed us how to solemnly genuflect, turn, place the vessels on the Altar, bow and depart. Arriving several hours ahead of time the next day, we Altar Boys were able to change into our robes well in advance of the Pope's arrival. We had help from a gentleman that I'll call our Arch-acolyte, for lack of a better term, even though he is probably a Cardinal. It took me three tries before I actually found a robe that he thought fit properly. This linen robe covered me completely, with an opening for my head. It was a plain, white outer garment with wide sleeves. 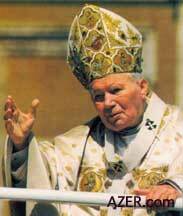 John Paul II arrived early and the Mass started on time. He stood on a mobile platform and was escorted by a couple of close aides. The platform afforded him mobility that he otherwise would not have had, due to his Parkinson's disease and crippling arthritis. No, the famous "Pope Mobile" was not brought to Azerbaijan. This newer contraption took him from his Mercedes to the inside of the Palace of Hand Games. From the Vestibule, he was received by us seven Altar Boys in the improvised sanctuary. We were each introduced and then given rosary beads. We were also given a bronze medallion commemorating the Pope's visit. The Altar Boys were designated various duties, such as carrying the censer, incense and so on. It turns out that I was the youngest of the Altar Boys. Another Acolyte and I had the responsibility for the lights. I also had to present the Chalice and the Paten [plate for the Eucharistic Bread] at the Altar for the Holy Sacrifice. I also carried the Altar Vessels that the Pope used for washing his hands. My final task was to carry the Holy Water to the Altar; this water was used to bless the cornerstone of the new Catholic church that is to be built in Baku. At present, a Catholic congregation of about 120 to 150 people meets in a chapel in the Ganjlik suburb of Baku. During the Pope's visit, President Aliyev announced that he would provide a building site for a new Catholic church. During the Pope's two-hour High Mass, the Palace of Hand Games was filled with more than 5,000 people inside the hall and another 1,500 people standing outside the building. The support and cheers that they gave the Pope when he left the Palace of Hand Games was quite phenomenal. It was really quite fascinating to see such interest and support from the Azerbaijani population. The Pope changed in the lone Sacristy, the same one we had used earlier. In addition to an Altar, there was the Pope's throne, complete with a safety bar to keep him propped upright and comfortable. Seeing the Pope up so close reminded me of Muhammad Ali. Just like the great boxer, John Paul II commands great respect and love. He was hunched over and seemed very sad-looking, but it wasn't a pathetic scene. As bad off as he may have appeared, I think everyone respected the positive life that he has lived. The Pope obviously tries to conduct his life as normally as possible despite the fact that he's been through so much. After all, he had just turned 82 the weekend before, he has Parkinson's disease, plus he has survived an assassination attempt, helped bring down Communism and traveled to more than 100 countries. For all that, I don't think he looked bad at all. In fact, he seemed very much alive and alert to me. The access and proximity I had to the Pope was incredible. I might add that the local Azerbaijani security seemed less stringent than they are with their own President. Perhaps that's what the Vatican security had requested. Still, it was the first time I had ever seen secret service priests, replete with the trappings of special agents, earpieces and microphones tucked into their sleeves. After the Mass, we Acolytes were allowed to keep the garments we wore, allegedly "to be buried in". We were also given the limited edition of the Eucharistic Celebration hardcover book that had been published specifically for Azerbaijan. It's in Italian and Russian. The Pope read the Mass from it in Russian. The text is printed in Cyrillic script, but there is also a transliterated version of the Russian in the Polish alphabet, indicating how the Russian words should be pronounced. The Polish Ambassador, a fellow Altar Boy, explained that it is easier for the Pope to read Russian if he uses the Polish alphabet. The Pope appears very comfortable in his role. One wouldn't say that the position is bigger than he is. He "wears the clothes", you might say. The sense of peace, comfort and professionalism that he exudes is overwhelming. His frailty is related only to the physical realm. His hat may slip off while he is sitting down, but he's really alert mentally. The international media spoke of a man attempting to rush the Altar. Actually when all that was taking place, I had my back to the ruckus, since there was a reading going on in Azeri. I glanced over and saw the Pope trying to receive a man who had rushed over to him. The intruder was immediately carted off by Presidential security. Later, he returned to thunderous applause and was received by the Pope. It seems the Pope is quite at ease and shows no fear. Actually, the man posed no sort of threat. He was obviously a simple guy who had lived a hard life and, overcome with emotion, simply wanted to personally greet the Pope. I also observed how the Pope interacted and really cared about members of his staff, who are very attentive to his needs. They are not awestruck by him but seem rather relaxed in his company. They joke and seem completely at ease. I guess they've conducted similar Masses a thousand times before. The officials surrounding the Pope made the experience very enjoyable for everyone involved. It's clear that the Pope is surrounded by top-notch people. I found them to be incredibly bright. They understand the logistics for such events like the back of their hand. For me, the Pope's visit was a an event that happens only once in a lifetime. He left Azerbaijan earlier than was planned; he appeared very tired, yet enthusiastic. But in the larger context, this was also a historic occasion for Azerbaijan. It's not everyday that a predominantly Muslim country like Azerbaijan receives the head of the Catholic Church. 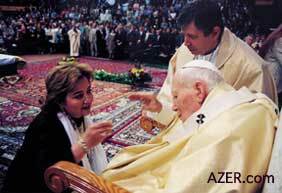 Having the Pope come to Baku was a huge honor for the Azerbaijani people. This truly was a unique opportunity for him to share the important message of peace and cooperation, a message that knows no boundaries or borders. Fulbright Fellow Jim Dasney is currently finishing his period of study in Azerbaijan. Angus Hay, a parishioner in Baku, also contributed to this issue's articles and photos related to the Pope's visit.